Capture your thoughts, discoveries, and ideas and simplify overwhelming planning moments in your life with your very own digital notebook. With OneNote, you can plan that big event, seize that moment of inspiration to create something new, and track that list of errands that are too important to forget. Whether you're at home, in the office, or on the go, your notes are available to you across all of your devices. Your notes in your style Type anywhere on this free-form canvas and easily rearrange and move your content to any place on the page. Style your notes as you wish. Make your notes bold, italicized, or colorful and organize your content with tables. Capture anything Add pictures of recipes, your PowerPoint doc or PDF for school, links to your favorite sites, and web articles for future reference. 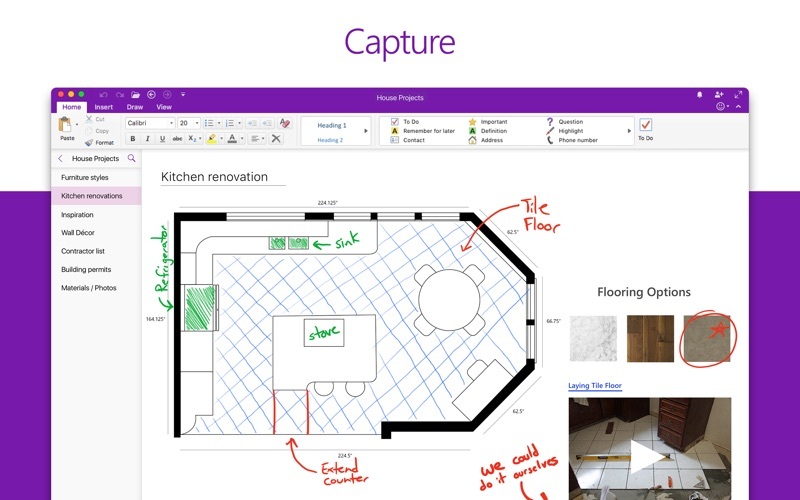 Capture it all in OneNote and add your annotations right on top of your content. Powerful organization Organize your notes in a way that works best for you. Create, rename, search, sort, color code, and copy pages, sections, and notebooks to organize your content as you'd like. Tag it Highlight can't-miss notes with Important and To-Do tags. You can then track a list of your daily to-dos, flag questions to raise after a meeting, or mark the important points from a lecture. Think together Share your notes with your friends and colleagues, whether you're planning a party with others or a working on a school project with your classmates. 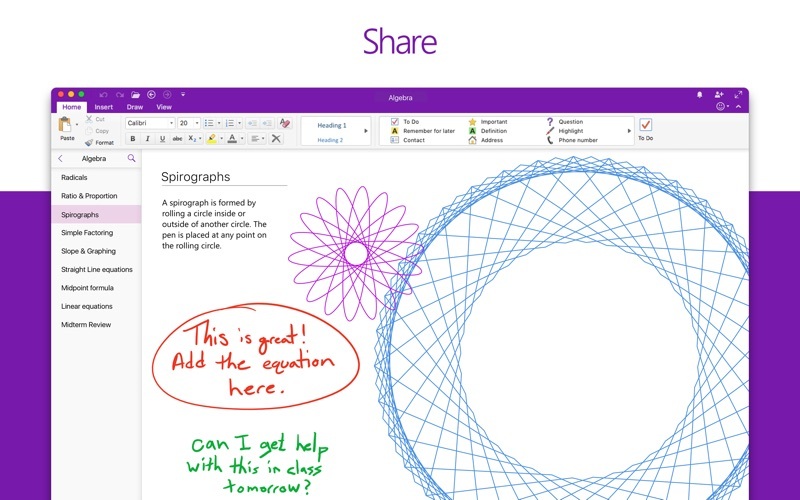 You can combine forces and all work together at the same time in a shared notebook. Always with you Access your notes on your Mac, iPhone, iPad and other devices. 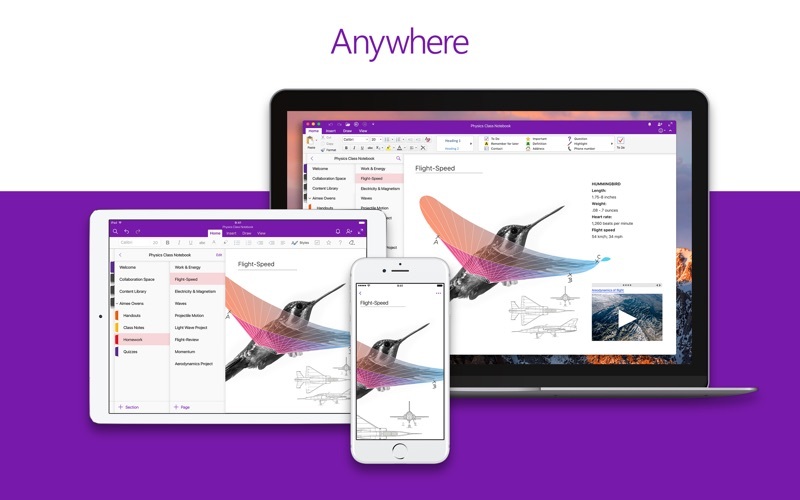 Your notes are synced to the cloud (OneDrive, OneDrive for Business, and SharePoint ) making it easy to access your recipe notes on your iPhone at the store, your homework on your Mac in class, or your itinerary on your iPad during your travels. 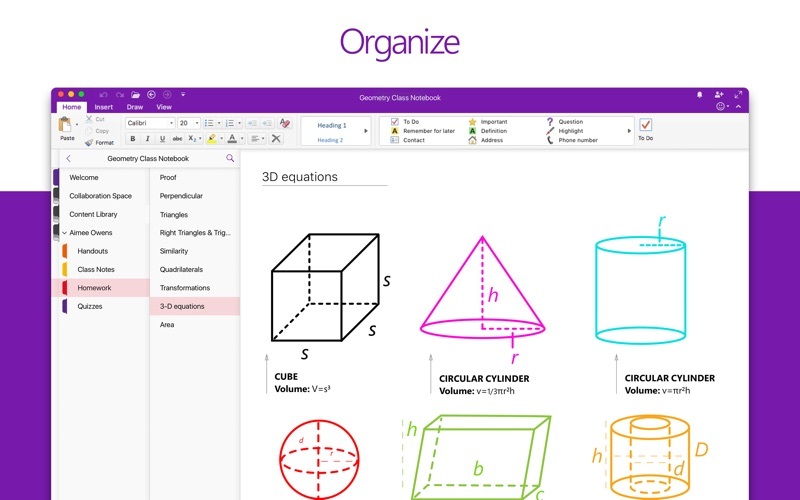 Achieve more with OneNote. Note: For you to sign in to OneDrive for Business, your organization needs to have a qualifying SharePoint Online or Office 365 business subscription plan. You cannot sign in with an account from an on-premises directory. Learn more about Office 365 Office 365 is a cloud-based subscription service that brings together premium versions of Word, Excel, PowerPoint, Outlook and OneDrive, with the best tools for the way people work today. Please visit: http://go.microsoft.com/fwlink/?linkid=2015120 for information on Licensing Terms. Unlock the full Microsoft Office experience with a qualifying Office 365 subscription for your phone, tablet, PC, and Mac. Office 365 annual subscriptions purchased from the app will be charged to your App Store account and will automatically renew within 24 hours prior to the end of the current subscription period unless auto-renewal is disabled beforehand. You can manage your subscriptions in your App Store account settings. This app is provided by either Microsoft or a third-party app publisher and is subject to a separate privacy statement and terms and conditions. Data provided through the use of this store and this app may be accessible to Microsoft or the third-party app publisher, as applicable, and transferred to, stored, and processed in the United States or any other country where Microsoft or the app publisher and their affiliates or service providers maintain facilities. Please refer to the Microsoft Software License Terms for Microsoft Office. See “License Agreement” link under Information. By installing the app, you agree to these terms and conditions. I use this to take notes during class, however whenever you click anywhere other than your text, it starts a completly new line seperate from the rest of the text. The syncing feature sometimes doesn't work and it is frustrating. If you have multple jobs/clients this is a great way to organize your life. I particulalry love it for lesson plans (I'm a college professor) as I can copy old notebook pages over to new semesters and then edit as I go, etc. It gets 4/5 because you STILL can't put borders around text boxes which I find very frustrating. But it does work great across all devices, etc. 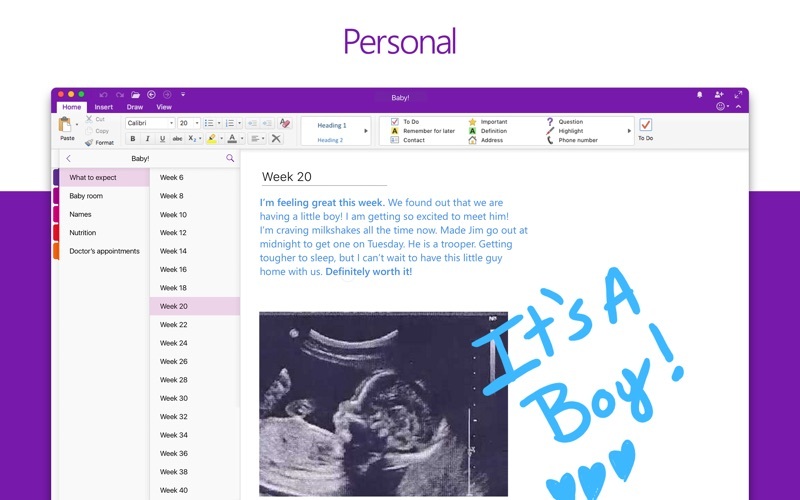 Honestly its ok. Its missing some features that are in the PC version of OneNote. I would love to see Ink to text since its not on the Ipad version either. This is probably Microsoft's best product. It's perfect across all platforms. It's seamless. Gives you an easy to use and powerful note taking experience that syncs up with all your devices. I use it on MacOS, Android and Windows on a daily basis. I just love it. It took a bit of getting into the capabilities but now I use it for everything from work to home and can view on all my devices. Not a day goes by that I don't use this now. It seems that the version works better on Win. Very robust. But typicl MS shortcomings. As an example the OneNote extension in Safari had the dreaded spinning wheel hang up this past week. Took me hours to fix. I hope MS can make OneNote more stable, it certainly has great potential. I am reliant upon OneNote to perhaps an unhealthy degree. A fantastic, easy-to-use application that allows me to organize (and quickly and easily find) vast amounts of information. I used OneNote through grad school, but had to step away when I switched to a Mac because the early function was too limited. Not so anymore—it's an amazing program. I depend on Evernote for archiving ideas and articles, and One Note to manage all my meetings.